Munich Fabric Start, the latest edition of which ran September 5-7, 2017 at MOC in Munich, continues to confirm itself as an important gathering for fashion insiders. The main show area and the Keyhouse were quite busy on the first day while the Bluezone area started quietly but welcomed more visitors from day two on. Most of the top insiders and experts from both the German and international denim scene attended thereby confirming the significance of this show. The present moment continues to be a difficult one for the industry as many denim weavers are suffering and many jeanswear brands are experiencing slow selling seasons both in Europe and in the US. In the hope of alleviating this problem many fresh ideas and opportunities for new business were presented at Munich Fabric Start including, for instance, a new generation of manufacturing machines and techniques which operated live at the Keyhouse area. In that same section, many new alternative materials were revealed. Among them, for instance, was Zvnder, a fabric obtained from the Tinder Fungus, a mushroom that grows on trees and provides a soft touch 100% vegan material similar to cork. Another new development was Nat-2, a sneaker model made by employing wood, stone and maize raw materials. Also interesting was the new Living Colour finishing process applied onto silk and cotton by employing bacteria and sound frequency–therefore employing some kind of music. In the Bluezone area Tintes Egara, a Spanish specialist in treatments and finishings, employed Recycrom, a newly developed and patented ecofriendly dyestuff by Officina +39 made by recycling 100% secondhand clothing, fibrous material and textile scraps into a new dyeing powder. Among the trends disclosed at the show for f/w 2018-19 (although also hinting at s/s 2019), most denim manufacturers focused their attention on new high-tech developments and athleisure. 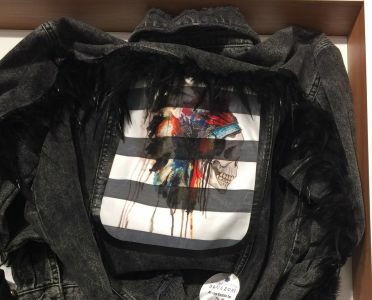 However, they also went in the exact opposite direction with highly decorated, torn, fringed and colorful denim pieces. In addition, sustainability remains an important theme and many brands continue to concentrate on and study new developments in that topic. Many believe that athleisure is still very important. “I think we have to convince ourselves that the young generations will not wear five-pockets anymore,” said Hamit Yenici, general manager at Calik Denim. “My son has five pairs of trousers in his wardrobe and only one is a five-pocket. In the future the young will only wear pieces similar to jogg-jeans,” he explained while presenting some new unwashed highly functional stretch denims that look like high-tech jerseys. Also Nilit, a nylon 6.6 fiber manufacturer, launched a new fiber, Sensil, a special soft touch and refreshing fiber that can be added to denim. And Berto Industria has developed a special denim employed for a new unisex sporty chic collection by designer Augusta Romano of Duplex Style studio. Among high-tech developments, Orta presented Biocharge, a denim that incorporates special minerals that are medically proven to refresh muscles, help support muscle regeneration and reduce stress or tension. Taking a different direction were the embroidered and fringed denim samples presented by US Denim Mills. Also cool were transparent fabrics incorporating jacquard indigo effects by 496 Fabrics and printed and striped shirting fabrics by Albiate 1830 and Blue 1925 by Canclini. The show’s talks and seminars were very interesting, highly involving and especially crowded this edition. The Denim Sustainability and Innovation Panel focused on the theme “Green Industry and Down to Earth Reality – How far is Eco Apparel to Become Mainstream?” was a clear hit and its participants included Alberto Candiani (Candiani Denim), Jill Dumain (Bluesign Technologies), Tricia Carey (Lenzing Fibers), Aamir Akhtar (Arvind), Johan James Van Breda (SAC), Ramon Rios Quintana (Santanderina), Lina Pfeifer (GOTS) and Georg Dieners (OEKO-TEX). It was co-moderated by Sabine Kühnl (Editor-in-Chief, SPORTSWEAR INTERNATIONAL) and Panos Sofianos (Munich Fabric Start). In addition, a new series of discussions held at the Bluezone as a collaboration with SPORTSWEAR INTERNATIONAL was launched. The new talk format “Regular’s Table at Bluezone Stammtisch” hosted Think Inc communication agency (Holger Petermann and Alexander Kratz) and Reachbird (Benidikt Ess and Philip Martin), software specialists in the digital influencer world. They discussed creativity, media and digital influencers.